I don't know if it's because of the field I work in or if it's just that good of an exhibit. 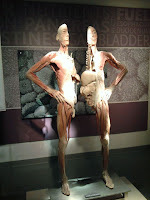 But I really enjoyed visiting BODIES...The Exhibition this week. 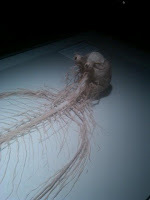 The exhibit had a docent at every turn, readily available to answer the burning questions of our inquisitive minds. I learned that there are not many female bodies on display. How did I find out? Because this body was clearly male, and he made me wonder. This one had his eye on me. Seriously. This body shows the central nervous system. 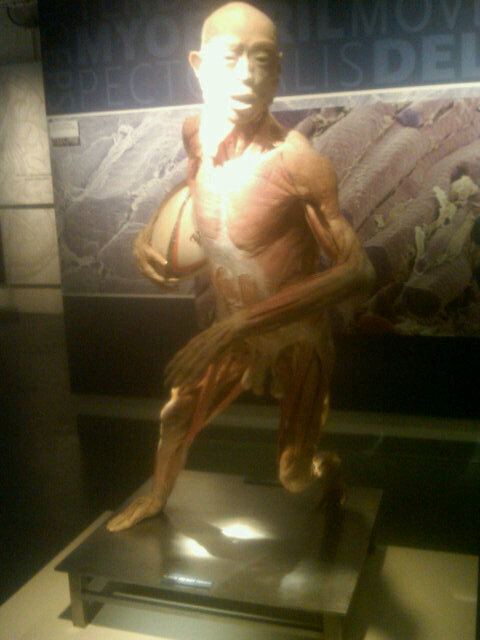 It is one of only a few bodies on display that has a true human eye. And with my family history with brain cancer, I was strangely drawn to the brain suffering from hydrocephalus and the skull after a craniotomy. Would I consider bringing Amara to see BODIES? Heck no. Any child with a sense of humor like me (you know, very pre-adolescent teen-ish), it's not an appropriate venue. And I'm not ready to explain fetal development to my daughter either. Will I take Dad2Amara? Absolutely. You can find more information BODIES...The Exhibition by clicking here. And for those in the Northeast Ohio area, get 20% off the cost of admission if you use the code "TWEET" before August 8 at the box office. Special thanks to @koskim for the invite! I have been debating whether it is something my ten year old would like or not. If so, I will end up going with a friend or my husband but I am not sure how interested he would be.